Printing architectural drawings to scale allows sharing them with others who may need to measure from the plans to order materials or construct elements for home improvement or construction projects. Printing architectural drawings to commonly used scales also enables using templates and symbols for furniture, appliances, plumbing fixtures, plants and trees readily available in the same scale. 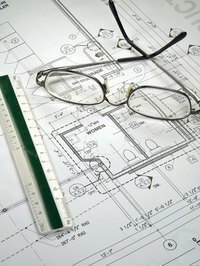 Drawings can be assembled from segments printed out on a home computer or printed out directly on plotters and large format printers at local blueprint or large format graphic service companies. Ensure that the drawing program used has an option to print drawings to scale. This will be listed as an option in the print menu. Most products will have this option, but if the chosen software package does not, switch to another program with the capability. Prepare the architectural drawing and select the option to print it to scale. The software will automatically segment the drawing and indicate how many regular-sized pages it will print to make up the overall image. Make sure you have enough paper in the printer and printout all the pages. Trim the pages with an X-Acto knife and straight edge. Piece the pages together and tack them in place with small pieces of transparent tape on the front to form the overall drawing. Flip the complete drawing over, and tape it more securely from the back. Take the assembled drawing to a copy service with large-image capability, and make the number of copies needed. Obtain the plotter or large format printer model number for the machine available at local blueprint or large output graphic service companies. Download and install the driver for this plotter or printer on the computer to be used for the drawing. Select this new printer as the printer to be used for the current drawing so its parameters help define the page layout. Set the page dimensions to stay within the limits of the service company equipment. Prepare the architectural drawing and save it to removable storage device like a USB thumb drive or disc. Take the storage media to the service company of choice and have the scaled drawing printed out. Alternatively, some companies will allow files to be sent via email or file upload. Be sure the file size does not exceed the maximum allowed. Have the files printed out and make the necessary number of copies. Plotter printouts are fairly slow and are made using pens on translucent paper. Typically, the plotted drawing is then run through conventional blueprint machines to make the desired number of copies. Imaging using large format inkjet printers is faster. Images can be printed on translucent paper that is then run through blueprint machines, but it is generally just as fast and inexpensive to make the needed number of copies using the large format printer itself.